Anthony Phillips plays on one song and (John's brother) Steve Hackett is featured on several, bringing a Genesis reference to this. This is an interesting double-CD set. The first is a studio album from John Hackett. I was really surprised with this disc. I was expecting something instrumental and fusion-like. Steve Hackett's first studio in four years shows that he hasn't lost a step in creating albums that go in different directions yet still manage to maintain a sense of coherence. While reviewing this on my PC, Windows Media Player listed this album as "There Are Many Sides to Steve Hackett." And who can argue? After the sprawl of The Lamb Lies Down on Broadway, the subsequent 102-date tour, and Peter Gabriel's departure from Genesis, one could understand the band's willingness to go on a prolonged vacation and take stock of their future. Fortunately, they didn't exactly sit still all that time. Two years after Steve Hackett's departure from Genesis, he released Spectral Mornings. For this album he organized a band that played full-time with him on tour and on this album. I like this set a lot. It’s classy. First we get the two CD set. Those expecting a typical Steve Hackett album will certainly be shocked by this. Those expecting Genesis styled prog rock here are likely to be disappointed. This is much more of a fusion set with some world music built into it. While I generally don't include live albums in my "best of the year" lists, I might make an exception for this. It's just such a powerful live set. The mix of sounds here is wide. We generally put fusion under progressive rock at Music Street Journal. I previously reviewed another set from this act and loved it. Their blend of fusion with prog and space rock lands them under prog, and the quality of the music gets them a nod of approval. Beto Hale lives in Mexico. It should be no surprise then, that some of the songs here are in Spanish. This is cool stuff. It’s always left-of-center, but it’s amazing how mainstream these guys can often make that. I really like this band. I've reviewed them in the past and always find them to be refreshing. Here is another set that doesn’t fully land in progressive rock. 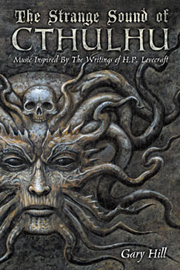 Most of the lyrics to this album are poems written by the late horror writer H. P. Lovecraft (1890-1937). The music is fusion-tinged progressive rock. Let's make this point abundantly clear, this is not progressive rock in traditional sense. Still, it is purely instrumental music, and often related to fusion. Here is one of the most delightful experiences I have ever had as a critic. Completely ignorant of this band and having no expectations at all, I find Hammers of Misfortune to be a totally original and invigorating unit. The discussion of progressive rock or not on this one is rather obvious. This is a unique and special album. I love the blend of sounds here. Comic Ian Shoales once said, during the hubbub concerning record ratings, that it would be a good idea to have ratings , but only the right ones, such as "TMS" - Too Much Synthesizer, "NGL" - Needs Guitar Lessons, and "OFMTMMTR" - Old Farts Making Too Much Money to Retire. If that's the case, then "The Muse Awakens" gets a rating of "BTRWTI" - Band That Records Way Too Infrequently. This disc, actually a compilation of previous unreleased early recordings by the band, has some very good compositions, but does suffer in places from poor recording conditions. One Way records saw fit to re-release both albums from Happy the Man, an instrumental progressive outfit lying somewhere between Genesis and the Dregs musically. Happy the Man was a US based prog band in the 1970's. The sound of the band was similar to many of the greats of prog, while forging out its own uniqueness. Cosmic Hug lives in sort of a wonderful area between jazz, prog rock and world music - close enough into the prog genre for me to include the CD review under that heading, but not content to be restricted by the title. Let's get the obvious out of the way first - this is not progressive rock. It is, however, fusion, and we generally land fusion under prog. I’ve never heard these guys before, but based on this performance, what an amazing band they were. This is unusual music, but then again, that’s an unusual name for a band. This disc has kind of weird mix of sounds. In some ways, it’s less a mix than a clash. I've reviewed quite a bit of stuff from this act. This is their newest album. They generally tend to skirt between psychedelia and progressive rock, and this set is no exception to that rule. I've reviewed quite a bit of stuff from this act, and you can always count on them for quality. This release is no exception. Hawklords is made up of some great musicians, several of whom have been in Hawkwind in the past. Hawklords is essentially a Hawkwind spin off band. One step on from the classic, yet volatile, Levitation line-up this release is a collection of tracks highlighting their performance of 1981's Stonehenge festival, re-sequenced and sounding at their most energetic since the days of Lemmy. I reviewed the original release of this before. However, this reissue includes three bonus tracks. I loved David Hayes’ previous two discs. This is rather unusual. David Hayes took his album Epics and reworked all the songs, creating an acoustic version of the set. So, as I said that’s unusual. This is quite an ambitious album. This new single from He Is Me is stunning. It's also unsettling in a lot of ways. While this EP isn't a clear cut fit under progressive rock, it works reasonably well there. For one thing, the electronic sound is progressive music, if not progressive rock. Heaven & Earth are finally back with a solid line-up and a great follow up to their last release. Let's get the classification question out of the way right at the start here. What if a bunch of prog rockers decided to write and perform a Broadway musical? That is essentially what we have here. This band is pretty fascinating. This album is quite a ride. It’s more of less space rock start to finish, but there is a lot of room within that genre. This act occupies an intriguing territory between space rock, folk prog and symphonic prog. I know some will argue with me including Michael Hedges under progressive rock. I love this album. It’s got quite a wide range of sounds. This is a cool set. It is clearly not for everyone, though. I could see this getting placed in non-prog as jazz. Prog rockers of the world, unite! This little trip down memory lane involves Henry Cow, a progressive outfit whose inspiration appeared to be Frank Zappa and Karl Marx. I’ll admit it; I’m not the biggest fan of Rock In Opposition. Take a Henning Pauly production and throw it in the oven. What comes out is sheet of well-baked Shrinky-Dinks severed into eleven elegant pieces. That's what this album is all about. Featuring Gayle Ellett of Djam Karet, this band is a great one. This outfit is from Portugal and if this set is any indication, they are pretty special. The names Ray Luzier and James Lomenzo are probably well known to anyone who has followed the career of Dave Lee Roth. The two of them (Luzier on drums and Lomenzo on bass) were Roth's rhythm section for quite some time. I really like this album a lot. It’s modern, but seems closer to old school prog than to the modern variety. This new live album is quite a cool one, both in terms of the music presented here and the full package. I have to say that I like pretty much everything from Steve Hillage. I reviewed the first volume from this act when it was released. This is the new edition. A reissue of this solo outing by Landmark vocalist Tracy Hitchings, this disc is almost more pop than prog. What an amazing set this is. It’s a collection of covers all delivered in an organic, soulful approach. This solo effort from Marillion front man Steve Hogarth is a very entertaining disc that covers many musical styles. The music moves from playful to contemplative to pop to prog with a proficiency and ease that is quite impressive. " I am sure the prog purists will argue with this landing under progressive rock. I'm not sure they are entirely wrong. There is definitely a lot of fusion in this album. We generally land fusion under progressive rock. That's because often the line between jazz prog and fusion is all about how much rock is included. I've reviewed Bob Holz in the past, and his music is consistently strong. We include him in progressive rock because that's where we usually put fusion. Oh, the Horror prog rock purists will feel as they run screaming from this one. Sorry, I couldn't resist that pun. I reviewed the digital version of this in the last issue of Music Street Journal. This time around we are looking at the CD. To describe this in one word would be to say “weird.” That doesn’t really encompass all of it here. Where has Hourglass been hiding all this time? Their latest album is awesome. After all these years Steve Howe is still exploring new territories or, at least, foraging in styles that interest him. H+ is actually a guy named Malcolm Brian Swan. This new release has some intriguing sounds. Based strictly on the music here, this probably wouldn't land under the progressive rock heading. Don't get me wrong. Hugh Hopper is probably best known as one of the founding members of Soft Machine. Best known for his work as the bassist in Soft Machine, this is the first disc of a ten disc set of archival releases from Hopper. Low key and rather jazzy; this is an intriguing prog album. Really a nice change of pace, and interesting direction for the genre to go in. In the tradition of the great prog experimentation of the '70's, this is a new and very original sound. Based on the title, the fact that Hunter is considered a blues guitarist and a couple little bits I heard, I thought this was going to be basically a blues rock album. Steve Hunter's music always seems to create a middle ground between blues rock, fusion and progressive rock. This disc is no exception.